ROV Deep Discoverer being deployed from the aft deck of NOAA Ship Okeanos Explorer. Image courtesy of the NOAA Office of Ocean Exploration and Research. Download larger version (jpg, 4.5 MB). Every NOAA Ship Okeanos Explorer operating season starts with an at-sea "shakedown," when all of the ship’s mission systems undergo rigorous tests to ensure everything is performing properly and that the ship is fully ready for the field season and will collect the highest-quality data possible. Shakedown cruises are essential to successful expeditions. 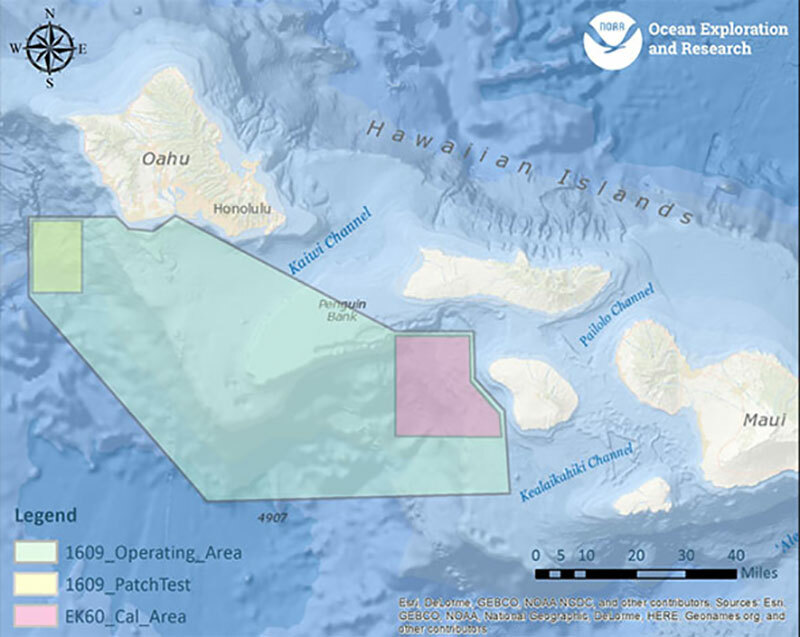 For NOAA, 2017 marks the third year of the ‘Campaign to Address Pacific monument Science, Technology, and Ocean NEeds (CAPSTONE)’ field effort to collect scientific data in deepwater areas of U.S. marine protected areas in the central and western Pacific. To prepare for the 2017 expeditions, the Okeanos team is conducting two shakedown cruises, both in and out of Honolulu, Hawaii, and focusing on targets in the vicinity of the main Hawaiian Islands. The first cruise, from December 1 – 8, 2016, is focused primarily on testing remotely operated vehicle (ROV) and telepresence systems. The second cruise, running from December 10 – 16, is dedicated to mapping and continued telepresence shakedown. Live video will be streamed throughout. On December 7, 2016, the 75th anniversary of the attack on Pearl Harbor, at the conclusion of the ROV shakedown cruise, the team on the Okeanos explored this Japanese mini submarine, five miles off the entrance to Pearl Harbor. The sub was sunk on the morning of December 7, 1941. Ninety minutes before Pearl Harbor was bombed by air, the destroyer USS Ward fired on the mini submarine, sinking it. The sinking of the sub marked the first U.S. shots fired and the country's entry into World War II in the Pacific. Video courtesy of the NOAA Office of Ocean Exploration and Research. Download larger version (mp4, 78.5 MB). 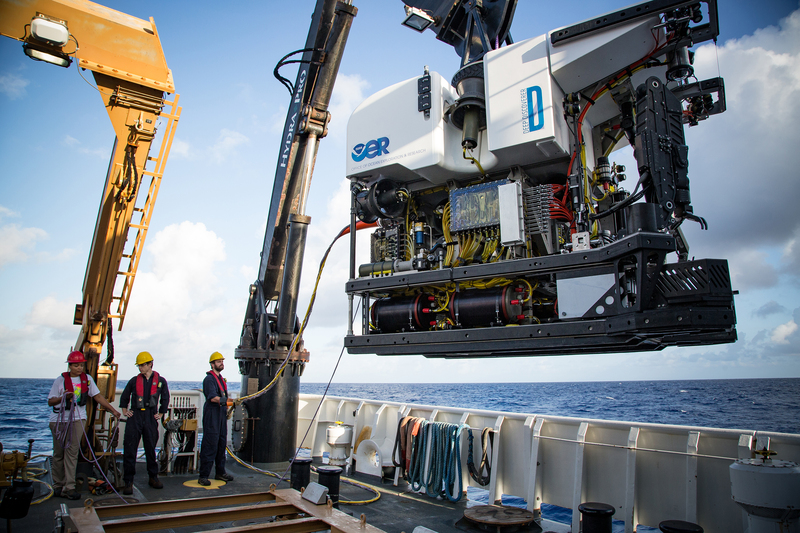 During the first shakedown cruise, NOAA’s two-body, 6,000-meter rated ROV system (ROVs Deep Discoverer and Seirios) will be deployed for a series of dives to depths ranging from 250 to 3,000 meters. During descent, all vehicle systems will be monitored to ensure that everything is running smoothly. Once the ROVs reach bottom, the engineering team will perform a series of tests to assess and troubleshoot mechanical, electrical, and software systems on the vehicles, with a focus on newly installed or rebuilt equipment. As engineering objectives allow, the team will conduct high-resolution visual surveys of the diversity and distribution of benthic (seafloor) habitats, including bottom fish habitats and deep-sea and precious coral communities. The Okeanos team also plans to investigate potential World War II shipwrecks associated with the attack on Pearl Harbor for more information about this portion of the mission, please visit this page. General operating area for the second shakedown cruise. The green polygon indicates the planned operating area for the cruise. The yellow polygon shows the approximate location of the multibeam patch test area and the pink box shows the operations area for the EK60 sonar calibration work. Image courtesy of the NOAA Office of Ocean Exploration and Research. Download image (jpg, 83 KB). NOAA Ship Okeanos Explorer has four types of mapping sonars onboard: Kongsberg EM302 multibeam sonar, EK60 split-beam fisheries sonars, Knudsen 3260 chirp sub-bottom profiler sonar, and Teledyne RDI Workhorse Mariner and Ocean Surveyor Acoustic Current Doppler Profilers (ADCPs). During both shakedown cruises, mapping operations will be conducted to test systems and to collect seafloor and water column data. Mapping operations during the first cruise will take place when the ROVs are not in the water. During the second cruise, multibeam, split-beam, and/or ADCP sonar mapping operations will be conducted 24 hours a day; sub-bottom profile mapping will be conducted periodically for testing purposes. Calibration of the EK60 sonars is a top priority of the second shakedown cruise. As part of the at-sea testing, the mapping team will conduct a system calibration, commonly referred to as a "patch test," to quantify the accuracy, precision, and alignment of the multibeam sonar. The calibration includes determination of residual biases in roll, pitch, heading, and navigation timing error. Slight alterations in any parts of the multibeam system can have large detrimental effects on data quality, which is carefully monitored throughout the field season. Multibeam data from both cruises will be fully processed according to standard onboard procedures and will be archived with the National Geophysical Data Center. Both shakedown cruises will also allow for the testing of the ship’s high-bandwidth satellite connection for real-time ship to shore communications, following the installation of newly upgraded equipment including new satellite modems and a new terrestrial network segment. The successful operation of Okeanos’ telepresence systems is critical for ensuring that scientists can actively participant in expeditions from shore and that members of the public can follow the real-time live video during expeditions. Ship shakedown cruises are also used by the ship to provided refresher and safety training for all crewmembers and to run all of the ship's equipment after a period of inactivity. Ships typically use shakedown time to perform safety drills and routine maintenance on major equipment including main engines, stern and bow thrusters, the dynamic positioning system, fast rescue boats, cranes, and even galley equipment like refrigerators and ovens. All of this equipment is essential to successful expeditions and must be tested at sea before heading to distant ports of call for several months. Following the shakedown cruises, the first major Okeanos expedition for 2017 will commence January 18. Learn more about 2017 plans here.